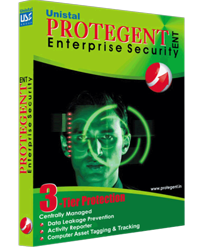 Protegent Enterprise Security features three efficient components to keep you safe from Information Security Breach. It includes Activity Reporter for comprehensive reporting with alerts regarding activities of employees in enterprise through a single management console, Data Leakage Prevention to avoid data leakgae possibilities and Asset Tracking to tag and track all the software and hardware assets. Automatic installation of required Software’s i.e.Window Installer, SQL 2005, .Net Framework etc. Centrally managed port access control and user control for workstations and servers. Generates a database at first start up for storing the activity reports of the server and client machines under protection. Auto enumeration of the entire network, showing the systems available. Auto generation ofport numbers for sending and receiving data between the server and client machines. Maintain remote client’s user name, password and other details in credential manager. Systems with Common Administrative user name and password can be saved as“everyone”. Using export option administrator can save the credential list. Import option to restore previously saved credential list. Deployment on multiple clients can be done simultaneously. Administrator can give Full privilegesto power user. If communication is broken between the client and server. Ifdeployed product is not workingatclient. If client isinactive with server for a configured days. Customization of reports according to administrator requirement. Defining different policies for different users. Backup and Restore option for policies (settings). After installation, auto-start-up of themodules makes the software user friendly. Easy installation with option of customizes installation. Option for the Backup of settings, reporting, network structure and license for later use. Restore option for the restoration of the earlier saved or backed-up data. Backup option at the Console and at the time of un-installation . Protection from unauthorized un-installation by asking for authorized password at time of un-installation. Detailed reports of each client. Option of IP range Deployment in the network. Prevent data theft as well as unauthorized access of critical data. Provides proactive protection against data theft by blocking USB, IEEE 1394, Network Adaptors, CD/DVD ROM, Printers, Infrared and Bluetooth with the flexibility to block single or multiple ports either permanently, on schedule or when idle. The USB device can also be white-listed for selected users. Unique feature of USB Read Only enables the admin/user to make any USB mass storage device read only. File transfer log feature generates the complete log of data transferred to and from mass USB storage devices. E-mail filtering option filters and block the Emails according to attachments, size of attachments, keywords in the body of the Email & Body size which are send from MS Outlook. This module helps you prevent unauthorized access to critical data. It also provides comprehensive reports as well as instant email alerts of port usage and if a user attempts to use a blocked port. Proactive protection against data theft. Sets restrictions against all communication ports by blocking and unblocking them. Prevent data theft as well as unauthorized access of critical data Unique feature of White listing the authorized USB by using unique hardware ID of the device. Feature of USB Read Only makes any USB mass storage device read only. File Transfer Log will show the reports of files transferred to and from a USB mass storage device. File Transfer Log shows the detail reports of files added, removed and renamed to and from USB mass storage device. E-mail Filtering log shows the complete report of filtered and blocked Emails of the MS Outlook client. Flash Drive (i.e. USB, External HDD etc.) Locking Block ports when PC is idle. Gives you information of usage of resources on the network by logging system usage time, idle time, keystrokes, websites viewed, chat interactions, file transfer logging, cut/copy clipboard information, application usage monitoring. It also captures screenshots of full as-well-as working screens and alerts on usage of Blacklisted Applications. This module helps analyze exact system usage and hence optimize utilization of resources. It also helps access employee productivity, user surveillance, forensics, and can also help you optimize IT purchases. Captures Application activity. With the help of application monitor time log can be maintained for specific applications. Captures all keystrokes, in case sensitivity. Option of showing system/non-printable keys is also available. Take screenshots within the specified time interval or on every mouse click. Option of different qualities of screenshot. Option of capturing the desktop and capturing the foreground of the window. Setting of report log size (Min 1 MB to Max 5 MB). Provides the details of the each user login and log out time Logging of working hours and idle time. Option to select the level of tracking. Send the reports to the specified email (in the stealth mode). Uploads all logs into the separate folders by FTP (in the stealth mode). Sending of report logs in a specific time interval. Password protected so only authorized personnel can access the reports. Loaded with an intuitive interface and very easy to use, even for beginners. Runs in absolutely invisible mode. Remote installation/update/uninstall. Captures ICQ, Miranda, Skype, Google Talk, MSN, AIM, AOL, Yahoo, QIP chats. Detection and notification of the custom keywords (alerts). Records contents of password protected web pages, including web mail messages. Monitors windows clipboard. Monitors computer activity only when user goes online (optional). Invisible in the Windows startup list. Monitors all users of the PC, even if you don't know their passwords. Intercepts DOS-box and Java-chat keystrokes. Instant install from a memory card or a flash drive. Reports of application activity, clipboard activity, working log, Internet activity, keystrokes, screenshots all in HTML format. Asset Tracking tool tags and tracks the condition of Hardware Assets of computers (i.e. Memory, Hard disk, Printer, Network, Processor, Motherboard, Monitor, Keyboard, Mouse, Operating System, and Sound etc.) & also Software Assets (i.e. Windows Info., Installed Software's & reports) if any changes occur on the system. Asset Tracking with Early Warning Systems for pending hard disk problems. It does this by continuously monitoring various hard disk parameters (such as Hard disk Temperature, S.M.A.R.T, & Details). Asset tracking provides the feature of Disk Cloning (i.e. it can paste the contents of a potentially fatal disk on to a healthy disk) and Disk Scanning (i.e. display bad sectors on hard disk(s)). Real time hard drive status monitoring. Avoid losing your important data due to hard drives overheating. Hard drive health status information. Amount of bad blocks or physical bad sectors on the hard drives. S.M.A.R.T. attributes. Disk scan option to check physical bad sectors. Prompts emergency system shutdown in case of hard drive overheating. Previewing raw values of S.M.A.R.T. © 2019 Unistal Systems Pvt. Ltd. All right reserved.